Despite blue-green algae elsewhere in the park, the Dog Beach at Prospect Park remains open, according to the Prospect Park Alliance. PROSPECT PARK — The toxic blooms are back. Blue-green algae toxic to humans and their pets has once again grown in Prospect Park Lake, state tests show, polluting a popular swimming spot for dogs in the park. The Peninsula area of the lake is now closed off to dog swimming following the detection of widespread blue-green algae, or cyanobacteria, with “high toxins” in the water, according to a Department of Environmental Conservation test completed last week. 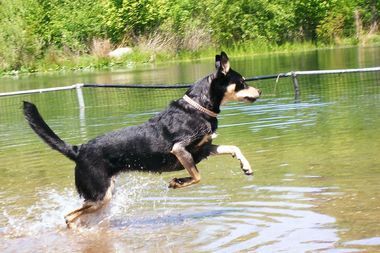 However, the park’s “Dog Beach” area is unaffected by the algae blooms so far, the Prospect Park Alliance told DNAinfo New York on Wednesday, and is open for public use. The algae blooms have formed in Prospect Park’s waters for four years in a row, appearing in the summer months and turning the lake vivid blue and green. Some cyanobacteria that produce toxins can make people or animals sick if the algae is ingested or comes in contact with skin, the alliance said. If a pet or a person is exposed to it, the group recommends rinsing the area immediately with clean water and to seek medical attention if irritation, allergic reactions, nausea, vomiting, diarrhea, headache or fever occur. In response to the recent problems in the park due to algae, the alliance is in the midst of planning a pilot study to create a filtration system known as an “ecoWEIR” that will aim to reduce excessive algae growth in the park’s waterways. The timeline for the project — made possible with $390,000 in funding from the New York State Office of Parks, Recreation and Historic Preservation — is not yet finalized, the alliance said. For more information about the causes and effects of blue-green algae, visit the DEC’s website.